As a member of the hospitality industry, you probably understand the importance of social media for marketing purposes. It has the ability to quickly and efficiently connect you with new customers, while helping you retain the loyalty of previous guests. Social media allows your guests to communicate with you directly to praise you for your excellent customer service, or to give you positive feedback after a memorable experience. But it can also be a method for guests to share a negative experience and any issues they may have encountered during their stay at your hotel. Social media is a powerful marketing tool, and it’s important to know how to handle the bad feedback with the good. 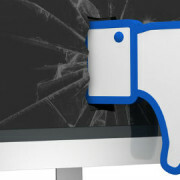 Here are a few tips on how to handle negative hotel reviews on social media. If a guest leaves negative feedback, it’s very important to respond quickly to address their concerns. -Reassuring your guest that you are taking their issues seriously and will try to help them in any way possible. -Allowing you to move the conversation out of a public forum, eliminating the possibility of a messy public dispute. If the guest declines, it’s still important to continue a dialogue and respond to them until you have helped to resolve their issues. When addressing guest complaints via social media, it is crucial for you to avoid confrontations and try to provide a constructive solution. While some guests may be near impossible to please, some customers simply need help resolving their problems as soon as possible. For instance, if a client has an billing issue, instead of assuming the guest has made an error, let them know you’re going to check your records, and offer them a detailed list of charges billed to them. This way the guest can feel confident knowing you are working with them, rather than against them, and that you are taking their feedback seriously. Some hoteliers make promises (to provide better service, cleaner rooms, better amenities, etc.) to appease guests after receiving negative feedback. And while many guests are not able to return to the hotel after their last visit to verify that these changes have been made, several potential guests who have read these reviews and responses will expect that these changes have been made. Make sure to keep your word if you make any promises, as this will inevitably affect the experience of your new guests, the credibility you hold with them, as well as your future profits. Do you have any more tips for how to handle negative hotel reviews? Let us know in the comments below!